The Midland Metro tram system, which links Birmingham with the Black Country, has lost more than £16m since it opened. The losses have been blamed on high running costs and a lack of passengers. The tram system, which runs from Wolverhampton St Georges to Birmingham Snow Hill, has lost £16.4m since the network was launched in 1999. Tram bosses also blame fare dodging and vandalism for the spiralling losses. Mechanical failures have also hit the system, and transport chiefs say the knock-on effect has been a lack of confidence among passengers. But a spokesman for Midland Metro said the reliability of the trams stands at 98 per cent. Fares are now set to rise to recoup some of the revenue. 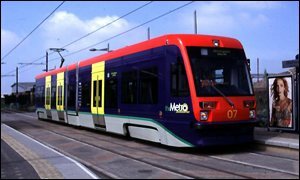 The latest figures show Altram, which operates the Midland Metro used by five million people a year between Wolverhampton and Birmingham, recorded an £11.4m loss in 2001 and £5m loss in the year 2000.